With a stay at Hyatt Regency Guam in Tamuning (Tumon), you'll be a 1-minute drive from Tumon Beach and 9 minutes from Guam Premier Outlets. 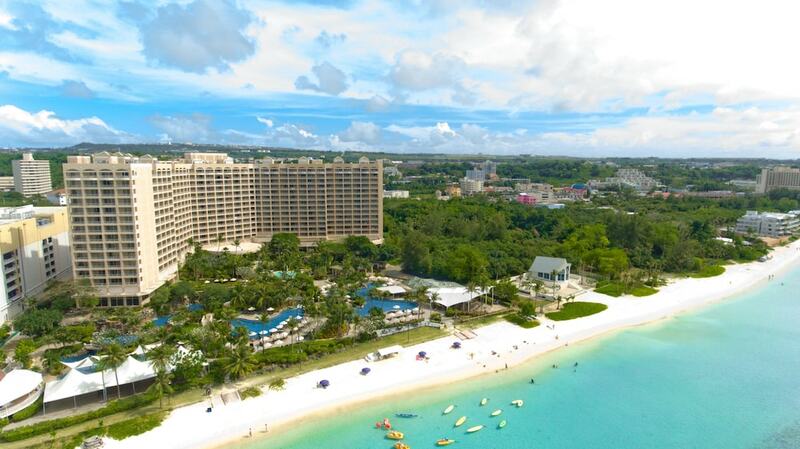 This 4.5-star hotel is 0.1 mi (0.2 km) from Slingshot Guam and 0.1 mi (0.2 km) from Tumon Sands Plaza. Make yourself at home in one of the 450 air-conditioned rooms featuring refrigerators and flat-screen televisions. Rooms have private balconies. Cable television is provided for your entertainment. Private bathrooms with separate bathtubs and showers feature bidets and hair dryers. Relax at the full-service spa, where you can enjoy massages, body treatments, and facials. You're sure to appreciate the recreational amenities, which include 5 outdoor swimming pools, a nightclub, and a complimentary water park. Additional amenities at this hotel include complimentary wireless Internet access, concierge services, and babysitting/childcare (surcharge). Enjoy Italian cuisine at Al Dente Ristorante, one of the hotel's 4 restaurants, or stay in and take advantage of the 24-hour room service. Snacks are also available at the coffee shop/café. Unwind at the end of the day with a drink at the bar/lounge or the poolside bar. Buffet breakfasts are available daily from 6:30 AM to 10 AM for a fee.